Moreover, a specific inCASA workshop was organized within the event demonstrating the inCASA approach, the technical solution, the services and evidence of the inCASA results, presented by involved inCASA Pilot professionals. INSERM, along with TID and REPLY, submitted an abstract paper for the annual meeting of the American Society of Clinical Oncology (ASCO). The paper was accepted and inCASA project was presented at a very important event in the healthcare domain on 2nd of June 2012 at Chicago. The inCASA poster can be found here. 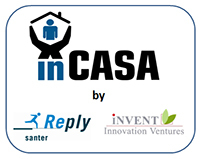 The first inCASA pilot is being planned with the partner Agenzia Territoriale per la casa della Provincia di Torino. ATC Torino is the public body with responsibility for social and public housing in the area of Torino and its surroundings. The Pilot will focus on user behaviour, providing an useful profile to search and determine behaviour that could lead to health problems. The inCASA project supports the Commissions activities in ICT for Health: eHealth. The inCASA platform allows for the creation of inclusive applications with accessibility for all. The project supports the Commissions campaign: eInclusion - be part of it! The inCASA project supports the Ageing Well Thematic Network which aims at creating a Community of Actors interested in improving the life of Elderly People by promoting the market uptake of ICT solutions for Ageing Well!